Do you ever find yourself at a loss for a side dish at dinner time, only to come up with a delicious new side dish? That’s exactly how this grated carrot salad recipe came about. I had decided somewhat at the last minute to make some fried cod for dinner. Cole slaw is always a must-have side dish whenever I have something like fried fish. Unfortunately, I didn’t have any cabbage or cole slaw mix in the fridge. The thought of going to the store just for that really didn’t sound appealing. I decided to try to come up with something that would be a satisfactory substitute for the slaw. My produce drawer didn’t have much in it, but it did have a whole bag of organic carrots. I also had some limes on hand and a red onion in the pantry. I decided to make a grated carrot salad with a lime vinaigrette. 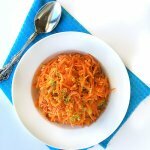 The combination of the sweet carrots, tanginess from the lime and a hint of smoky flavor from the chipotle chili powder totally checks off one of my favorite flavor combinations. 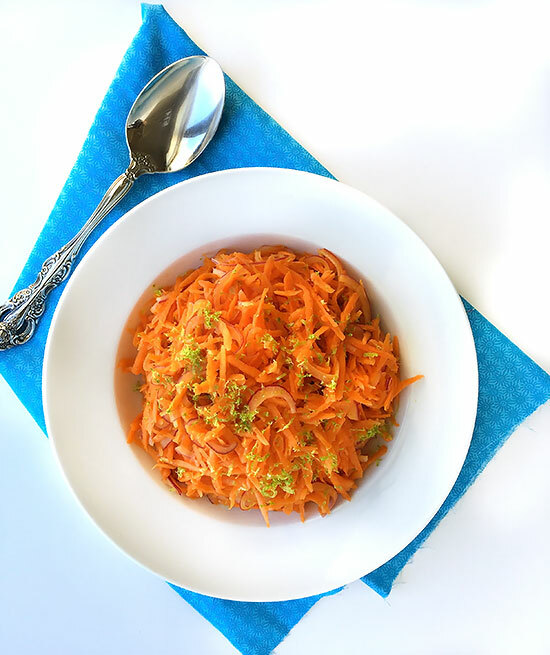 This Grated Carrot Salad is not only super yummy, it’s also a very affordable side dish. I served mine with fried cod, but this would also be great served alongside some Mexican seasoned grilled chicken. To complete the meal, I served some of my leftover Jalapeno Cheddar Einkorn Cornbread Muffins that I had tucked away in the freezer. Delish! If using, zest the lime before cutting. In the bottom of a large bowl, whisk the lime juice, olive oil and seasonings together until combined. Add the carrots and red onions, mix together, let sit for 1 hour or cover and refrigerate for a few hours before serving. If refrigerating, let come to room temperature before serving.